Roughly 95% of our Harry Potter licensed merchandise lives within my VM areas. 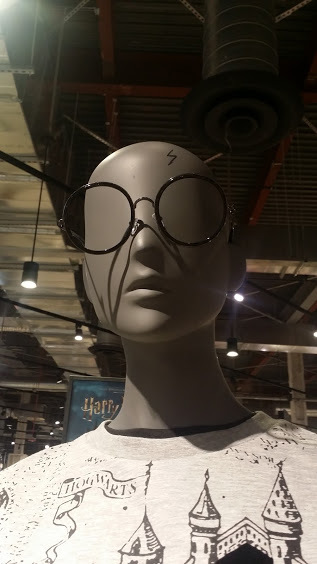 Through strategic cross merchandising of HP product, use of signage, and implementation of, "see it, buy it," I created one stop shops in prominent, high traffic areas and lead our store to be the second highest grossing in the US for Harry Potter sales. Completed without the aid of a wand. October's Alfred Hitchcock display, saw the combined sales of the Zita and Elevate collections jump from $4,638.25 the previous month, to $12,514.23. My eye-catching, prominent display, led to a staggering 170% increase in sales!! After removal of the display, sales of these collections dropped significantly, to $5,086.93. Amazing what a few film canisters and an old, incomplete bar set can do for your product, if you know how to use them. A walk around the table reveals the filming of, "The Birds." Ending on a Winter story. Happy Holidays!